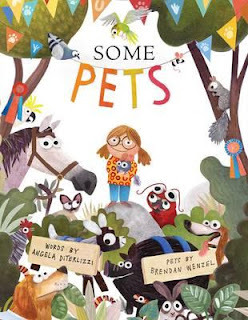 In a wonderful follow up to Some Bugs, Angela DiTerlizzi and Brendan Wenzel are back with Some Pets. Set at a pet show, Some Pets is a simple rhyming story that showcases a profusion of pets and explores how they move, eat, speak and behave. This book is a lot of fun. The story is short, but it is engaging and also interactive. The pets featured are never named, so kids can delight in calling out the animals they see and guessing which ones are squeaking, squawking or slithering. Brendan Wenzel’s illustrations are superb. He uses bucket loads of colour in a funky textured style that makes you want to touch all the pages. I loved his quirky animals with their giant eyes, and I enjoyed exploring the fun and funny details. Some Pets is a celebration of furry, feathered and hairy friends. With a shorter word count and visually engaging illustrations, it’s a great choice for younger children. And with fun information about animals and the book’s interactive possibilities, it’s also a perfect choice for older animal lovers as well.